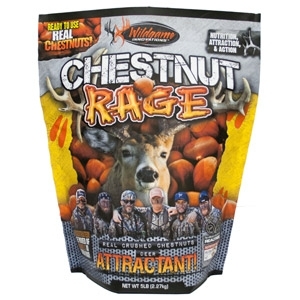 Chestnut Rage® Deer Attractant contains a mixture of ingredients that deer cannot refuse. Improve and maintain the health of your deer herd by feeding them Wildgame Innovations' high protein, nutrient filled blend of crushed chestnuts, extruded rice bran and other proprietary ingredients. When used repeatedly, Wildgame Innovations Chestnut Rage will keep deer hanging around in the same area for extended periods.